The large flat fenced front and side yards are a great spot to enjoy the fresh mountain air and scenic view. The mountain view from the yard rival the beauty of any in the national park. The side yard has fire-pit, Hot tub, charcoal grill, picnic table and scenic mountain view. Whether your in the Hot tub or sitting around the fire pit, the sunsets over the mountains are beautiful to watch. Cool mountain air, scenic mountain sunset and the warm glow of a fire equals a relaxing evening. After the sun sets the mountain air cools, the moon glows bright above and the hot tub warms the night. Relax in the fresh mountain air while watching the glow of a fire. The open living room with a comfortable sofa and large satellite TV and DVD player. The fully equipped kitchen including dishwasher, microwave and all cooking utensils. Mountain Mist is perfectly located just a few short miles from beautiful downtown Bryson City, keeping you close to the shops, restaurants, and fun attractions in town. You are close to the Deep Creek entrance of the Great Smoky Mountain National Park, offering a beautiful location to picnic, hike, tube, explore waterfalls or just sit and breath in the clean mountain air. Cherokee is just a 10 minutes drive away, and white water rafting on the Nantahala river is just 15 minutes away. The steep driveway to this cabin is necessary when you see the spectacular view that will surround you. A stone pathway will lead you from the driveway around the house to the front door. 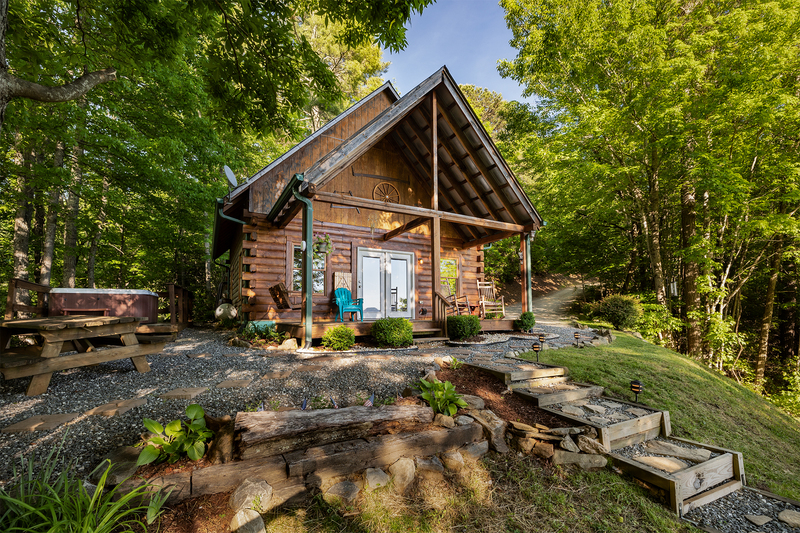 The yard is furnished with cozy Adirondack chairs for you to sit and enjoy the gorgeous mountain views that frame this cabin. Also in the yard, you will find the relaxing hot tub, and accompanying fire pit for your outdoor enjoyment. The front porch has a set of delightful rocking chairs and peaceful porch swing for your pleasure as well. 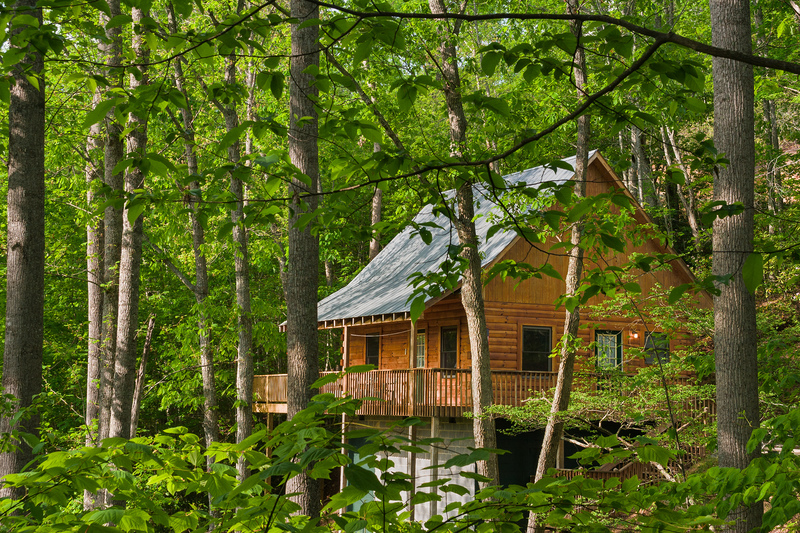 Mountain Mist is a magnificent single level two-bedroom cabin that sits overlooking the majestic Smoky Mountains. Stepping through the front door, you are welcomed into an open living room and shared kitchen floor-plan. The living room is furnished with a matching soft suede couch and love seat, and large flat screen TV for your relaxing enjoyment. Attached to the living room is the kitchen, fully equipped with all the appliances you will need for an enjoyable vacation. There is a dining room table that can seat four people, as well as a wonderful island that sits central in the kitchen with three additional bar stool seats for additional seating. To the right of the living room is the master bedroom, furnished with a restful queen size bed, walk in closet, and private bathroom with a standing shower. To the left of the living room is hallway that will lead you to the second bedroom, furnished with a queen size bed and additional twin size bed. Also down this hallway, you will find a shared bathroom with standing shower, as well as the laundry room with washer/dryer combo and plenty of counter space for folding. These rental cabins are near Mountain Mist Chalet and are a great choice for friends or family members who want to stay close to you but still have the privacy of their own vacation rental cabin.